Getting started is always the hardest part of any journey. Ask anyone who has tried to lose weight or begun any worthwhile task and you will find it is the first step that we all fear. 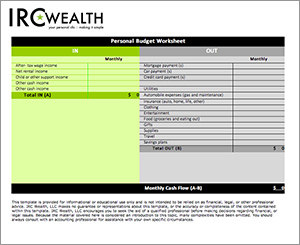 To make this simple for you, download and use our free Personal Balance Sheet, Personal Budget and Debt Summary Worksheets (Excel). Achieving your financial goal requires a detailed action plan. The simpler the plan, the greater the likelihood of staying with that plan. 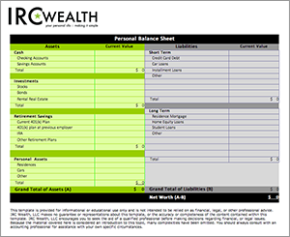 The list of assets and liabilities will become your own Personal Balance Sheet. Should you have more money going out than coming in or if your net positive amount each month is not enough to reach your savings goal, then you’ll need to look at ways to adjust your lifestyle and to perhaps reduce some fixed expenses. Re-examining your financial goal and timeline might be warranted. 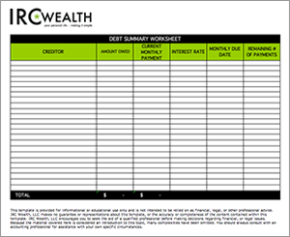 Assuming you have some debt, as most Americans do, use our Debt Summary Worksheet to see the whole picture as you begin to plan your debt-reduction strategy.